Description: NS 285  gets passed bu NS 57J  at Chattanooga,Tn. Description: A gray engine for a gray day. NS 173 rocks through the plant at North Kannapolis. Description: NS 174 heads Northbound on the Marion Branch at CP-79. Description: NS 9816 heads up 174 at CP-79 on the Marion Branch. Description: Extra Z4J which is usually 64J the trash train heads east through Bethlehem on the Reading Line Cutoff. 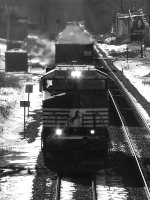 Description: 21M rolls through Phillipsburg with two dash 9's and an SD70M. Description: 21M battles heavy snow as it heads West through Phillipsburg. Description: After making a crew change, Norfolk Southern 2764 leads 9816, a CP 285 in Northwood, Oh., as it heads east across the CSX at Vickers diamond, in nice sunlight, heading for northeast Ohio. Description: UPRR Minneapolis Roadrailer Terminal. Description: Westbound on track two with a Still in blue GP38 in the consist. Description: One of many trains that passed the campground at Hershey, PA. 8/12/2008, (I have to double check my notes, but off the top of my head) he had 5 units, 3 NS, 1 ex-CR, and a Black River locomotive going for wheel work. Description: Trailing the usual assortment of deadhead power on NS train 34A was Black River's newest locomotive headed to Enola for wheel work. Description: NS westbound train 34A has extra units in tow headed for the locomotive shop at Enola. 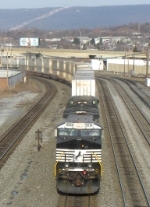 Description: NS C40-9W 9816 leads 129 (Bellevue Oh. to Linwood Nc.?) West through New Albany.